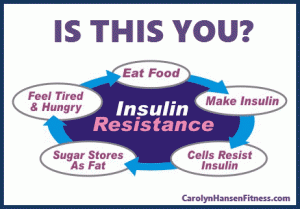 Insulin resistance on the other hand is a condition in which cells fail to respond efficiently to normal actions of the hormone insulin and the result is your body gradually becoming more and more resistant to the effects of its own insulin and eventually becoming chemically unbalanced. Common in people with obesity or type 2 diabetes. When this occurs, high level of glucose remains circulating around the body together with high levels of insulin as the body tries to clear glucose from the blood stream. This situation is not only the perfect scenario for weight gain, but it causes other more serious health issues like diabetes. The pancreas compensates for this resistance to insulin by producing more insulin eventually leading to an increase in blood insulin levels. The pancreas simply cannot maintain this high insulin output indefinitely and the result is insulin levels begin to decrease while blood sugar levels increase until eventually diabetes becomes the diagnosis. Obesity induces insulin resistance and effects the body’s ability to shuttle glucose into cells especially after consuming a meal high in carbohydrates. This excess insulin in your blood stream also suppresses the level of fat burning hormones and puts the brakes on your body burning fat for energy. To put it bluntly, excess insulin levels make you fat and keep you fat and this becomes a merry-go-round until you correct the imbalance. These high levels of insulin are detrimental to the body in a few ways. Not only does insulin regulate glucose metabolism, but it has other important functions like stimulating cell proliferation and survival. The consistent, continuous activation of insulin pathways contributes to cancer development by fueling cancer cell growth. Although the link between obesity and cancer has been well established, it is still in the early stages of research. However, recent research linked obesity with the incidence and mortality of a number of cancers such as pancreas, colon kidney, prostate cancer in men and breast and endometrial cancer in women. With diabetes and obesity escalating on a worldwide scale, we can no longer ignore these diseases as causative factors in cancer development especially for older people. Typically insulin increases when our bodies are fed lots of high nutrient rich foods but this same insulin drops when we are in a fasting state. Bottom line is this, when body tissues become resistant to the action of insulin which often happens with obese people, a balancing mechanism increases insulin production further leading to chronic hyperinsulinemia. Although there are other factors such as poor thyroid function that can also cause insulin resistance, unhealthy dietary choices…especially foods rich in refined sugars and carbohydrates as well as refined, saturated ad polyunsaturated fats are the primary players that impair glucose and insulin homeostasis. Leading a sedentary lifestyle, lack of sleep, emotional stress and exposure to environmental toxins are all lifestyle stress triggers that can lead to insulin resistance. Cancer is a merciless killer and no one should have to deal with the effects of cancer on themselves or their loved ones. Paying attention to our diets and lifestyle is important if we are to beat this dreaded killer…and diet and lifestyle for the most part are decisions we make every day. Truth is, most cancer can be avoided…if we step to the plate and take the right actions ahead of time. It’s time to take control of your life and “Just Say No To Cancer” is just the program you need to get you there.